Sreevidhya Chandramouli is a tenth generation descendent of the illustrious Karaikudi Veena Tradition of South India. She learnt the art form from her mother, Late Smt. Rajeswari Padmanabhan (grand-daughter of the legendary Karaikudi Subbarama Iyer). Sreevidhya later pursued advanced vocal training with Late Sri. Vairamangalam Lakshminarayanan and Smt. Suguna Varadachari. Sreevidhya has been teaching music in the Pacific Northwest for more than three decades, preserving the subtle aesthetics and purity of the Karaikudi tradition. She has served as artist-in-residence at The University of Oregon School of Music and as artist-in-residence at the University of Washington's Department of Ethnomusicology. She has performed widely in Asia, Europe and North America. Some of her prestigious concerts include performances at the John F Kennedy Center for the Performing Arts, and Library of Congress, Washington DC, Festival of Saitanklange (Festival of Stringed Instruments, Museum für Völkerkunde & House of World Cultures, Germany), Long night of Indian Music for Sender Freies Berlin (Berlin Radio) and KIT Tropentheater, Netherlands. She has collaborated with Pundit Uday Bhawalkar of the North Indian Dhrupad tradition, drawing parallels between the two ancient vocal-Veena traditions of India. She is also a watercolor artist and a disciple of the legendary musician, musicologist and painter, Late Sri S. Rajam. Her paintings were exhibited by the Cedar Mill Library, Portland Oregon. She was featured along with her mother in the book "The Singer & the Song: Conversations with women musicians" by C.S. Lakshmi (published in 2000). Chandramouli Narayanan is a ninth generation descendent of the Karaikudi tradition. He learned the art of playing Veena under his mother, Late Smt. Lakshmi Ammal, (daughter of the legendary Karaikudi Subbarama Iyer) in the ​Gurukulam​ style. ​He pursued an electrical engineering degree and worked as a software engineer for Intel. He is currently an independent consultant providing software services. He is also passionate about teaching Veena and vocal with Sreevidhya Chandramouli to students in the Northwest. He continues to compose in Tamil and revive Carnatic compositions to impart to students. 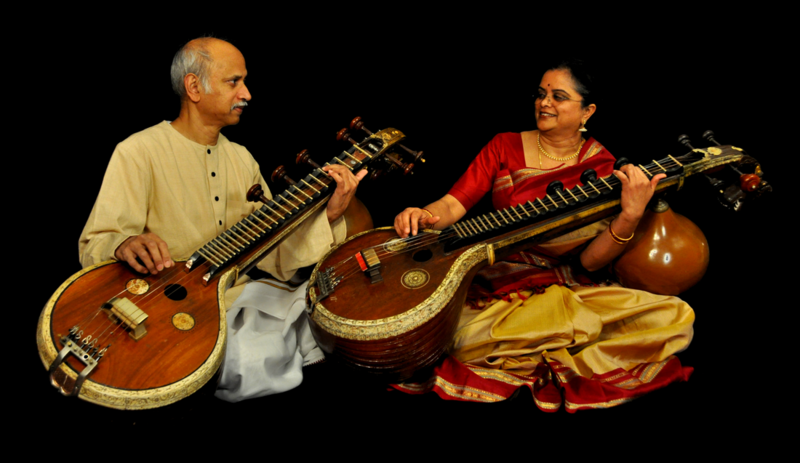 Sreevidhya Chandramouli and her husband Chandramouli Narayanan are the founding members of the non-profit organization Dhvani, committed to the Education, Preservation and Dissemination of Art forms of India.